Each week, Tarbell visits with local chefs, restaurateurs and the many people who make the region one of the most dynamic dining destinations in the country. 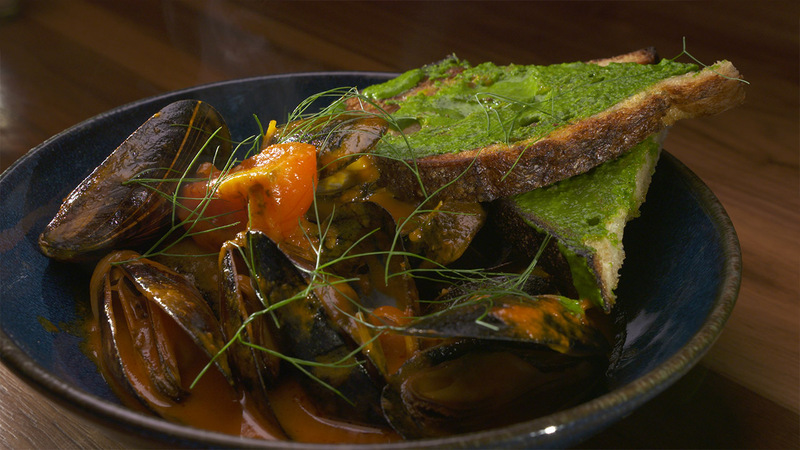 The 13-episode season will help you experience the science and artistry behind some of the region’s most innovative and popular dishes. Plus, you will have the opportunity to recommend your favorite restaurants for Tarbell to explore on the show. Tarbell, who was nominated by the James Beard Foundation for “Best Chef – Southwest,” is the owner of the popular Tarbell’s Restaurant as well as The Wine Store and The Tavern in Phoenix. In addition to winning “Iron Chef America,” in 2007, Tarbell has appeared multiple times on The Cooking Channel. WATCH: See the most recent episode here or follow the links below to watch individual segments. Mark Tarbell joins chefs in the pasta room at Fat Ox and pops into a pop-up dinner prepared by Hidden Kitchen. We’ll also explore The Pork Shop, a butcher shop with deep family roots that serves, among many other delights, over 40 kinds of sausages. Plus, Mark demystifies opening and decanting wine. Mark joins a third-generation pizzaiolo at Fabio on Fire in Peoria and samples tiramisu made from a generations-old recipe. He also chats with the owners of Voilà French Bistro in Scottsdale, who are newcomers to the United States. Plus, discover unique cookies and more at Super Chunk Sweets and Treats and explore which spirits are on fire right now. Mark stops by The Maine Lobster Lady food truck to compare notes on the perfect lobster roll and sits down with local musician Roger Clyne, who shares secrets and stories about his Mexican Moonshine Tequila brand. Plus, check out The Dressing Room, a former drag club that now incorporates flavors from around the globe. At the Desert Botanical Garden, Mark discovers how Gertrude’s uses their surroundings to create a taste-of-the-desert menu. We’ll also see how The Tamale Store crafts their award-winning bundles of perfection and how Chula Seafood is “reeling” in a loyal following. Mark visits Joe’s Farm Grill in Gilbert, a unique twist on farm-to-table located in Joe Johnston’s childhood home. We’ll also visit Cuff, a cozy family-owned restaurant in the heart of downtown Glendale. Plus, Snoh Ice Shavery serves up a modern spin on a traditional Chinese dessert, and the founder of Press Coffee shares why a cup of joe is a great way to end the evening. See how CRUjiente Tacos takes the simple street taco and turns it upside down with inspired flavors, and how Fàme Caffe creates a drink they call “pastry in a cup.” We’ll also visit Rovey Dairy, where a Glendale family has been farming since Arizona became a state, and Thailicious, where nearby Asian markets made Chandler the perfect location for this restaurateur. Located at the Andaz resort, Weft & Warp, serves food as beautiful as the landscape surrounding it. See why farm-fresh ingredients have elevated Fàme Caffe to a neighborhood favorite, and explore the signature sips and homemade sweets at SodaRush. Carnitas slow-cooked and seasoned with beer, carne asada baked in banana leaves, tortillas made from Arizona yellow corn … that is how a young chef on Roosevelt Row creates the street tacos at Taco Chelo. You can sit near the open windows or the intimate bar to enjoy tacos, a traditional margarita or sangria made with fresh-squeezed juices. Watch what happens when a lawyer and a rocket scientist join forces to serve the perfect cup at Peixoto Coffee and see why Mark comes down with “oven envy” at Pa’La. Then end the meal with a decadent dessert from elements at the Sanctuary. Mark heads to Vincent’s on Camelback to see how this veteran chef uses Southwestern influences in traditional French cuisine. We’ll also visit Camelback Market, a farmers market located in the parking lot of Vincent’s. Meet a husband and wife who are creating unique dishes at Confluence in Carefree, and the fastest bartender in the world shows us the perfect nightcap. Chris Bianco shows Mark his latest venture, Tratto, and how he uses his passion for local wheat to create spectacular pasta dishes. Chef Nobuo shares his unusual path from Japan to opening the highly acclaimed Nobuo at Teeter House. Plus, we head to Seacat Gardens to see how a guy in tech is now known for his incredible produce. Mark heads to Wren House to see how they’ve converted an old bungalow into a modern taproom and takes a trip to Asiana Market for a whirlwind shopping trip for unique foods. Plus, meet a ceramics maker whose plates can be found in some of the world’s most famous restaurants and a bartender who shares his twists on traditional cocktails. It’s the season finale, so Mark gets “smokey” at Little Miss BBQ in the Sunnyslope neighborhood of Phoenix. We’ll see what’s on the charcoal grill at Bry in Phoenix, and Mark goes vintage at the American Way Cafe in Chandler.